Within the frame of the Festival “Translating (in) Europe. Naples 22-29 November 2010” – a event and last segment of the European project “E.S.T.-Europe as a Space of Translation”, financed by the Culture Programme of the European Union and patronized by University of Naples “L’Orientale” – the project manager Camilla Miglio and this magazine organized a series of cultural events and workshops focused on research upon the wide concept of translation, intended not only in its synchronic phenomenon (this meaning comparing very different language and media: literature, popular culture, music, theater, visual art, performing art) but also in its diachronic approach, examining the relationship between classical literature and modern translations. ‘Translating the antiquity’ is a way to connect distant cultures in order to consent the survival of ancients in our century. The investigation addressed different courses: historical roots of national languages, considering the medieval lyrics and their lead role in transferring classical myths in the modernity (ancient German, late Latin, Greek byzantine, Persian); re-writing and re-interpretation of classical texts in the poetry of P. P. Pasolini – who conceived the translating process like a visceral appropriation and assimilation; divulgation modalities of the ancient culture, which demands the interest of the modern readers. 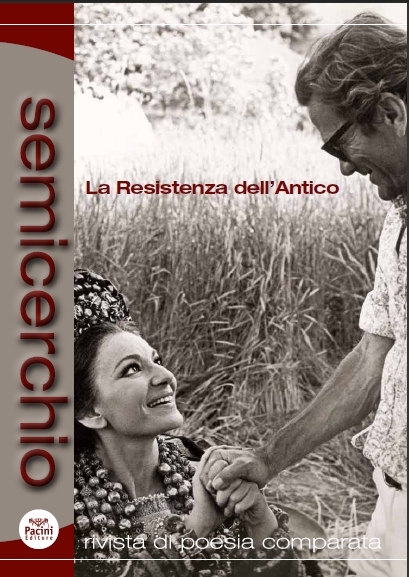 The recent intense debate on translation as cultural mediation and appropriation can put a new light on Pasolini's rich activity as translator, which aimed at exploiting exchange and contamination. His versions of more or less canonical classics must be considered creative and aesthetic acts. Some observations about Pier Paolo Pasolini as translator from Greek (Aeschylus) and Latin (Vergil): his technique, his style, his peculiar way to modify the classical source text in a permanent conflict between didascalic and subjectivistic intentions. The paper explains the raisons and the objectives of the round table and analyses two translations of Pasolini from the Carmina Burana that had never been examined before. (Francesco Stella, Università di Siena, francesco.stella@unisi.it). Presentation of the round table about Sanguineti’s translations from classic authors and about the book edited by Roberto Andreotti La resistenza del classico, which gathers many relevant contributes about the afterlife of Greek and Latin Literature. Giancarlo Abbamonte - Roberto Andreotti, I classici tra Scilla e Cariddi. Andreotti calls for the role of School and University education, Publishing Houses, and the Media, in promoting a much needed divulgation of the Classics (ancient texts and artworks) in order to enhance both their ‘alterity’ as a cognitive act and their age-long success in different cultural ‘frames’, where their revival and ‘re-readings’ come into play with current issues. Moreover, Andreotti exposes a recent advertising campaign in favour of the archaeological attractions of Rome, disclosing/highlighting the vagueness and ambiguity of the divulgating project of the ‘Sovrintendenza’. Public Institutions should protect not only the material asset of our Classic heritage but also the correctness of the ‘vulgarization’ of its symbolic values. Roberto Andreotti, Redazione "Alias", roberto.andreotti@ilmanifesto.it. Presentation of the round table about the translations of medieval poetry and preliminary remarsk about the field of medieval latin literature. This article focused on the importance of the translation practice, versus any theory of it. Translation is techne, not episteme. Knowing the mother language and the destination language is essential for writing a text pleasant for its reader. The translator is a writer himself: literary translation needs to take into consideration – above all – the audience of its readers. Translating poetry in ancient norreno opens the possibility of divulgation in the modern age of the ancient German culture. In Italy Byzantine poetry is still little known to the general public, despite the presence of ogg anthologies with translation. This paper tries to give a sample of the interest of such poetry, dealing with the genre of ‘lyric’ poetry. The categories of modern lyric poetry do not fit Byzantine texts, for which it is often more appropriate to speak of persona loquens rather than poetic ‘I’; nor there was in Byzantium a poetic production comparable to the Latin medieval lyric poetry. Nevertheless one can find in some periods of the Byzantine millennium the emergence of lyricism experimented in literary genres as ‘personal’ or ‘mourning’ poetry; especially in the poems of the tenth and eleventh centuries we find examples of what we can define ‘lyric’ poetry from a modern point of view. In the appendix I briefly examine the main Italian translations of Byzantine poets available on the editorial market. Medieval Latin literature is a unique phenomenon in the history of Western culture for its duration, extent and importance. Based on three axes -classical, christian and Germanic- medieval Latin culture, it is the collective memory of Europe; therefore it allows to us to find a cultural European identity. For this reason translations of mediolatin texts into the various national languages are now necessary and commendable. This article introduces the Italian series Scrittori latini dell'Europa medievale edited by Francesco Stella for Pacini Editore,Ospedaletto (Pisa). José Maria Micó, Tre canti dell’Inferno in spagnolo. This paper explores Russell's use of the sonnet as a sort of poetry gauge, a form whose structures are closer to inner discipline than to bare Literary tradition. Sonnets tend to the same subtle shape more closely than their division into different parts and rules may suggest at first. They all incarnate poetry and life at once, better than interpreting them, because poetry is not what you do but what you are, perpetually. critic and writer, editor-in-chief of the Russian literary journal "Znamja" and president of the jury prize "Poet". The two poets read some poems of theirs which are here presented in original language and Italian translation. Introduction, texts and and translations of some poems of the Angolan poet awarded with the Ceppo International prize 2013. This paper is devoted to a contemporary author from Moscow, Andrey Rodionov (born 1971), one of the most popular Russian poets of his generation. We especially stress the importance of the city of Moscow itself (and the area of Moscow's suburbs in particular) in Rodionov's aesthetics. We also present the translation of three texts from Rodionov's book "Suburban toys" ("Igrushki dlya okrain", 2007).